It finished with a 20 minute ride home shortly after midnight and the scent from tulips riding shotgun filling up the cab of my car. I don’t even remember if I turned on the radio, but I have a crystal clear memory of looking up to the dark starry sky hanging over Interstate 24 and laughing, asking God, “Did you just see that! ?” I’m assuming he was aware that not long before my rhetorical yet not-so-rhetorical question I was sitting in a random restaurant in Smyrna, Tennessee. Where is Smyrna, I’m sure you’re dying to know. Drive Southeast from Nashville on I-24, exit 66B and you’re there. It’s a developing little town with stores and structures that are all less than 5 or 10 years old. To call it a suburb of Nashville is still an upgrade, but it’s not a bad little place, and not far away from the downtown entertainment of Music City. There’s a Buffalo Wild Wings off of Sam Ridley Parkway, and that’s where I sat for at least 30 minutes waiting to give my credit card to Christy, the waitress. She brought the checks by and yes, they were separate checks. This night did not begin as a date and it sure as hell never became one. I’m a gentleman, but you’ll know when I take you on a date. There won’t be any doubt. Christy failed to circle back around to pick up our forms of payment. The most difficult 30 minutes I’ve ever suffered through, and I survived Hurricane Andrew, the worst hurricane to hit the States up to that time. If I could go back and lay in the hallway with a mattress on top of me, desperately holding on to Belle’s collar, I would. Well, I would if it meant I could time travel away from Buffalo’s sitting across from “Freckles of Fury.” On the exterior, she was very attractive. A petite Asian girl with a great smile. But at this point, while we were waiting for Christy to return, it had probably been an hour or so since Fury smiled. I take that back, she smiled quite a bit in her conversations with people dining nearby. Her friendliness, in fact, was the first and last straw that compelled me to ask Christy for the checks. Fury confessed that she frequents this Buffalos often because in Smyrna, what else is there to do? So she’s made a few friends around the bar. I’m being completely genuine in applauding that behavior. Friends are fantastic people. But I realized I was the odd man out. I wasn’t anyone’s friend there… all to clear when I looked around. Everyone was cheering for Kentucky, Ohio State or North Carolina. Me? Florida State. Remember that commercial when the Dolphin fan jumps up and claps in a sea of Buffalo Bills fans? Now you get it. And this was more than basketball. As the veil was lifted, I saw the glances from her “friends,” accompanied with whispers, laughter, and a unanimous agreement that I was the worst thing since fanny packs (which are awesome, by the way). So there we sat, me slightly interested in Fury, and throwing up a final attempt to make a connection. Hoping for a buzzer beater, I asked her a few questions that, with any normal human, would lead to more conversation. However, each was shot down with a quick and thoughtless, “no.” Rejected like a bad jump shot. It was then I realized she was more interested in everyone else, and even more importantly, this chick was annoying. But I’m glad she has bar friends because those are the friendships that last. So I asked Christy for the checks. My concern about the success of the night was slowly becoming more important, but only after it was raised to threat level orange (the highest of all threat levels). Like a stinky Vietnamese hotel bed sheet, the story unfolded. I can say that because I’ve been to Vietnam (don’t spend the night on the boats in Ha Long Bay, that’s all I’m saying). Fury and I were at our table for about an hour and a half, sharing a basket of cheesesticks, when frat guy turned professional d-bag approached and chatted quitely with Fury, on her outside shoulder away from me. Is this really happening? Is this 5 foot 4 guy really doing this? Questions answered as he walked away and Fury turns to me and says, “I’ll be right back.” She goes and chats at a table with frat-bag. Of course, I was so embarrassed and yet, boiling mad. Ten years ago, I would not have handled this well on the spot. But I’m much wiser now, so upon her return and attempt at an explanation, I calmly said, “You don’t have to explain anything to me.” I kept watching my Noles but inside I was Evander Holyfield and Shorty McDeuche was taking a beating like a punching bag. That was the first visible sign this night was not going well. Up to that point I was doing pretty OK. Perhaps I should’ve been more decisive when she all but accused me of being a terrible dog owner. Perhaps I should’ve taken note when she kept responding “What?” when I offered a question. Perhaps I should’ve taken secret option 3 when she thought it odd that I ordered root beer. Oh, option 1 was stick around. Option 2 was leave. Secret option 3 was toss the drink in her face and say, “My root beer brings all the girls to the yard!” then stomp out. I chose option 1 and it was all down hill after that. In my defense, I put myself out there. I met up with a girl and hoped for the dream. I didn’t know it would go the way it did. Success or failure is always on the table, and it’s impossible to know which will win. So that’s why, early in the evening, I jumped in my car and drove to Smyrna, stopping at a flower store on the way to pick up her favorites. Tulips. 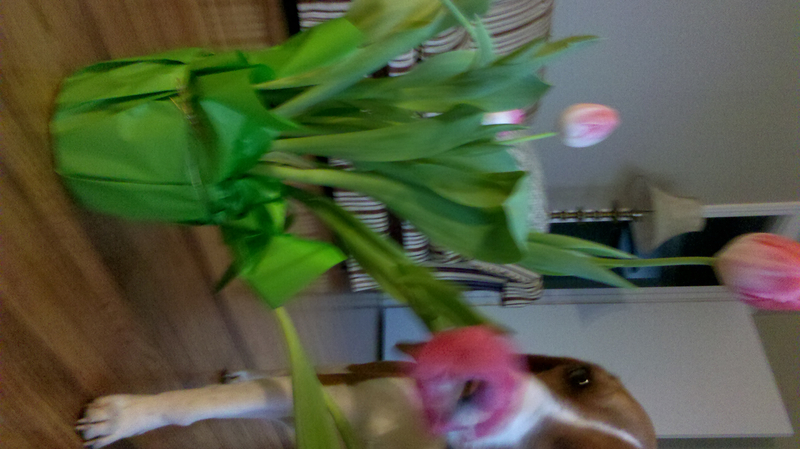 Tulips I gave to Piper to make up for being a bad owner. This entry was posted in Dating / Relationships, Experiments, Society and tagged Buffalo Wild Wings, buffalo wings, cheese sticks, Christy, dates gone wrong, dating, deuche, deuche bag, dousche, Florida State, Ha Long Bay, Kentucky, North Carolina, Ohio State, Smyrna, spicy, Tennessee, tulips, Vietnam by Ben Wilder. Bookmark the permalink. oh….oh…dear….yikes. see, this is why i persist with the NOT dating. not that that’s getting me anywhere either. “Not dating” has is benefits, that’s for sure! Thanks so much for the comment about Belle. She’s still missed!